The TCU Fraternity and Sorority Council held a spring rush event for potential new members in the Brown-Lupton University Union ballroom Monday night. Twelve Interfraternity Council chapters were in attendance, along with three fraternities each within the Multicultural Greek Council, National Pan-Hellenic Council and Independent Greek Council. According to the Fraternity and Sorority Information Guide, 49 percent of TCU’s campus is involved within the 41 Greek organizations. Spring recruitment only involves the 21 fraternity organizations. Spring recruitment lasts until Feb. 11, when all the bids are due back. Potential new members will receive an official notification of their acceptance into the fraternity. Victor Norris, NPHC vice president and current Omega Psi Phi member, explained how NPHC recruitment is different than IFC’s. The four councils and the fraternities within will plan community involvement through philanthropy events. IFC is known for their “Movember” philanthropy event held by the Sigma Phi Epsilon fraternity. “Right now, we are exploring various philanthropic ventures, usually consisting of volunteering at the Tarrant County Area Food Bank and other community centers,” Norris said. According to the information guide, TCU’s fraternity and sorority community raised more than $205,000 for various philanthropies and completed more than 32,500 hours of community service. 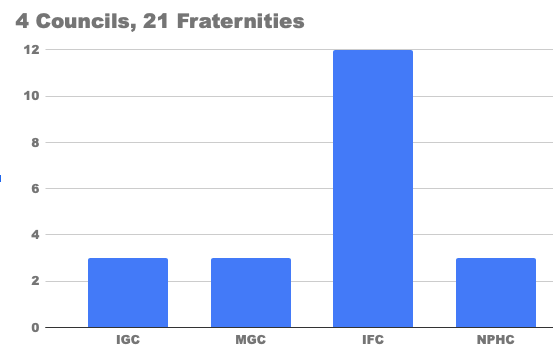 The IFC consists of the president and a delegate from each chapter, along with the nine member executive board elected by the chapters each November. The IGC involves faith, band, and music-affiliated member organizations. IGC promotes and fosters academics, social interaction, service and chapter development. The MGC involves organizations including Latin, Hispanic and Asian-American founded Greek-lettered organizations. MGC’s purpose is to unite multicultural Greek-lettered organizations on campus. The NPHC organizations engage with both the campus and community through various initiatives like education, service, programming, and cultural awareness. Through fellowship and acts of community service, bonds and friendships are built both within each individual organization. For more information on Fraternity and Sorority life, or to get in contact with members of the executive board, visit the TCU student affairs website.